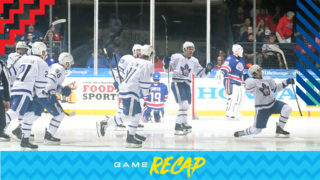 The Marlies returned to action Friday night for their first home game since January 12. 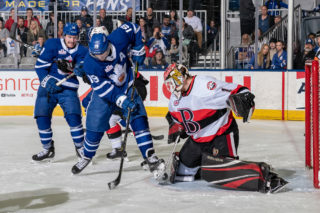 Coming off a shootout win over the Belleville Senators before the All-Star break, the Marlies were looking to start the month off on the right foot and make it two in a row. The Marlies peppered Rocket goaltender Charlie Lindgren with 36 shots throughout regulation but could not find the back of the net. 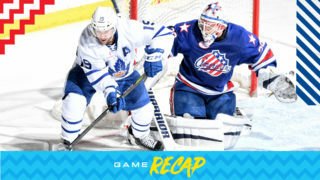 It would take overtime to solve tonight’s contest, and an early penalty in extra time lead to a 4-on-3 for the Marlies. At 2:09 of the overtime frame, Trevor Moore sent a cross-crease pass right on the tape of Chris Mueller who banged home the overtime winner. Calle Rosen picked up the secondary assist on Mueller’s game winning goal. Michael Hutchinson turned away all 15 shots he faced to earn the shutout. The Marlies and Rocket square off again tomorrow for a 4PM start at Coca-Cola Coliseum. Chris Mueller scored the lone goal of the game 2:09 of overtime on the power play. This was his sixth game-winning goal of the season. Mueller now leads the Marlies in goals (20). Mueller has seven points (4 goals, 3 assists) in five games against the Rocket. Trevor Moore recorded the primary assist on Mueller’s overtime goal. Moore has 28 points (19 goals, 9 assists) through 35 games this season. Calle Rosen picked up the secondary assist on Mueller’s overtime goal. Rosen has six points (1 goal, 5 assists) in his last six games. Rosen is tied for first amongst all defencemen in assists (37). Michael Hutchinson stopped all 15 shots he faced for his first shutout as a Marlie. Hutchinson is now 6-3-2-1 on the season with a .906 Save Percentage and a 3.04 Goals Against Average. Toronto went 2-for-2 on the penalty kill and 1-for-4 on the power play. The Marlies have recorded a goal on the power play in four straight games. Toronto had a 37-15 edge in shots in all situations. Colin Greening led the Marlies with five shots on goal. 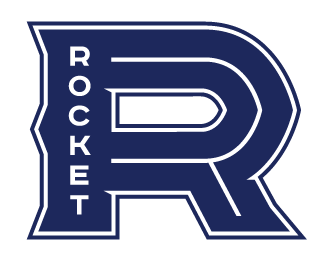 The Marlies are 16-13-3-3 against North Division opponents and are 3-2-1-0 against the Rocket. Toronto is 20-4-1-1 when scoring first. The Marlies are 6-3-0-0 when tied after the first period and 6-1-1-1 when tied after the second period. Toronto is 13-8-2-1 when outshooting their opponent. 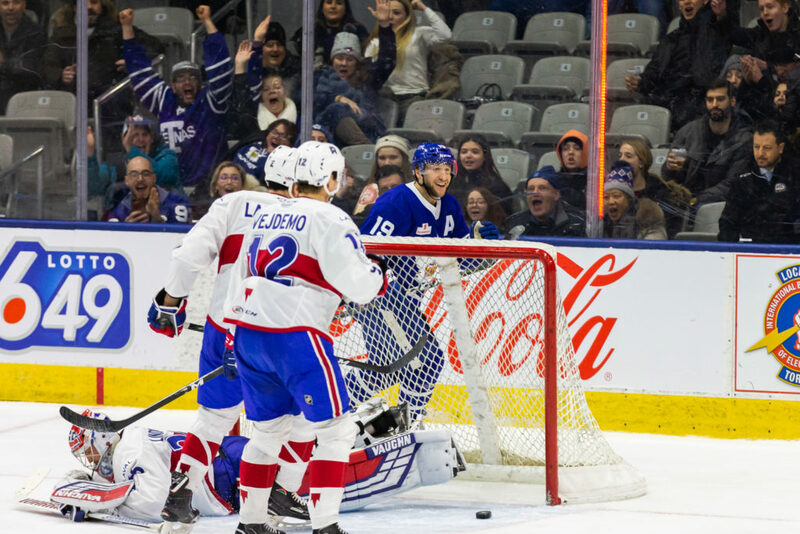 The Marlies are 7-4-1-2 in Friday games and are 1-0-0-0 in February. Chris Mueller has recorded points (1-1-2) in consecutive games. Calle Rosen has recorded assists (2) in consecutive games. Mason Marchment left tonight’s game in the first period and did not return. I thought it was a really good game for us. Parts of the second period I think, you know, that we’d like to do better. But, first through third periods, as good as we could probably ask from our guys with the exception of executing on our chances, finishing around the net but really good effort by our team and deserved the two points. It was good to see us get the win in. Nothing right now other than he’s going to be out and that he’s going to miss some time. We’ll get him assessed here in the coming days and know more then. But certainly not going to be in for the next little while. We did expect that. You know they do a good job of not giving you a whole lot in terms of odd man rushes or making too many mistakes, they don’t take a lot of chances. As a result, you go into the game fully expecting it to be tight throughout. And certainly, you don’t get a whole lot of looks on the inside, I thought that we did have some. And we didn’t make good on them, maybe overpass at different times. But that is sort of what we’ve come to expect playing against Laval. You’ve got to be really good on special teams to get an edge. And we were unable to break free in that area until overtime obviously. But I thought we did a nice job of really controlling the play, which is something that we struggled to do against them in most of our games that we played against them with the exception of the last two. This one here (and) during the second one out there in Laval when we went there for back-to-back games so that’s a good sign that we’re feeling our way through how to play against them. But scoring and breaking the game open is a whole other thing and that’s kind of the next step but it doesn’t come easy, it’s not just us its everybody in the league. 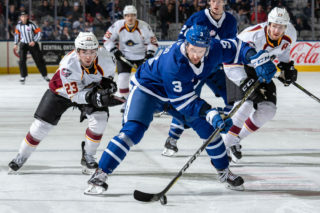 After a few days off following the AHL All-Star break, the Toronto Marlies return to action Friday night to host the Laval Rocket. This is the Marlies first game at home since January 12thas the team was on the road for their annual Toronto Boat Show road trip. They finished out their annual Boat Show road trip 3-1-0-1, collecting seven of a possible 10 points and outscoring their opponents 19-17. Tonight marks the sixth meeting between these North Division rivals and the Rocket currently hold a 3-2 lead in the season series. 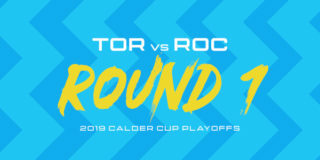 An important two points are up for grabs tonight as the Marlies currently hold the fourth and final playoff spot in the division with only five points separating the two teams. 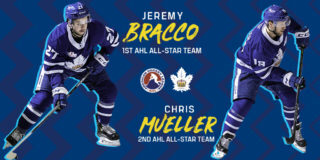 Players to watch: With six points in his last five games, Jeremy Bracco now holds the team lead in points with 43 and sits second in assists in the league with 31. Alex Belzile leads the Rocket with 35 points (10 goals, 25 assists) and has four points in his last four games.